Standard Audio was founded with the goal of designing and developing unique and creative pro audio products. After 10 years of production and over 1,000 units sold, we have decided that it is time to release a new version of the Level-Or that retains the sound and vibe of the original, but includes improvements and features suggested by our customers over the years. 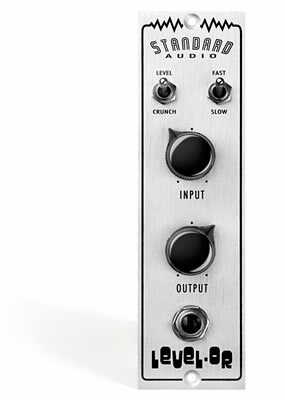 For those not familiar with the original Level-Or, it is an aggressive JFET limiter and harmonic distortion generator inspired by the SHURE Level- Loc PA limiter from the 60s and 70s. The Mk2 version takes the original concept to a new level with improved performance and added features making it an extremely versatile studio tool. To celebrate 10 years of smashing and crunching, the first run of the Level-Or Mk2 is released as a limited “ANNIVERSARY EDITION” in black. result the Mk2 noise floor is 12-15dB BETTER than the original Level-Or. Mode Switch – Switches between Level, Crunch, and Bypass modes. - Bypass Mode: We have included a relay based true-bypass. - Level Mode: Sound of the unit is dominated by an extreme JFET limiter. Use this mode to slam, squash, and pummel your audio signal. - Crunch Mode: Sound of the unit is dominated by distortion generated from a series of discrete transistor based, Class A amplifier stages. Use this mode to provide subtle saturation and harmonic enhancement all the way to heavier distortion and outright destruction of your audio signal. LED Indicator – A dual color LED serves two functions. When the unit is in Crunch mode, the LED is red and in Level mode, the LED is green. While in bypass, the LED is off. While in Crunch or Level modes, the LED will get brighter according to how much compression (Level) or THD (Crunch) is occurring. This can provide helpful feedback to the engineer. Speed Switch – Formerly, the speed switch provides two release times (fast/slow) while in Level mode, and was un-used in Crunch mode. We have expanded to a 3 way switch and added functionality that changes, depending on mode. - Level Mode: There are now 3 release times, FAST, MED, and SLOW. The FAST and SLOW settings are the same as the original, with the added medium time constant in between. - Crunch Mode: The speed switch now controls a 3 way low pass filter on the output. This can be very useful for reducing harsh, higher harmonics while distorting. When set to FAST, the filter is bypassed. When set to MEDIUM, the LPF is 15kHz. When set to SLOW, the LPF is 8kHz. Instrument DI - The original Level-Or had a line input via a front panel 1/4” jack. While useful for interfacing with a drum machine or synthesizer, it was not useful for guitar, bass, or any other instrument level source. On the Level-Or Mk2, we have changed this to an instrument-level DI input. DI MODES - The unit detects when a 1/4” jack is inserted and switches over to the DI input. - DI Bypass Mode: When the DI is used, putting the unit into Bypass mode sends the clean DI signal to the output of the unit. The unit functions as a clean DI with gain, no external amplifier required. The output control is active to adjust level as needed. - DI Crunch Mode: The DI signal is sent through the input gain stage and all controls work as normal including the filter switch. - DI Level Mode: The DI signal is sent to the limiter and all controls work as normal. *It is possible for the user to configure the front panel 1/4” input to be configured as a line input if desired. A 100% enclosed steel chassis reduces the chance of electrical interference or noise from adjacent modules, gear, etc. The Standard Audio Stretch is a 500 Series, multi-band compression/dynamics unit based on noise reduction units from the 1970s and 1980s. 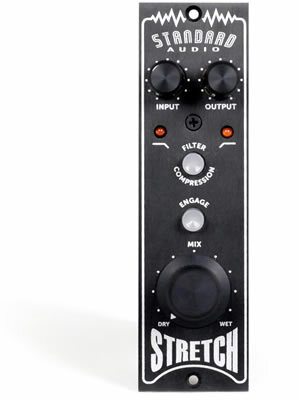 Stretch emulates the sound of these classic units in their respective “encode” modes. However, the Stretch adds new features to employ this old trick in multitude of new ways. The Stretch allows the user to use the 4 separate frequency bands in different combinations to sculpt or accentuate individual tracks or a mix in ways no other compressor or EQ can achieve. The onboard Mix Control dials in the perfect amount processing with the original dry signal. Use the Stretch to add air to vocals, add sparkle to acoustic guitars, add sheen to overheads, add punch to drums, make bass tracks thunderous, or even create additional depth and detail on the whole mix bus. The possibilities are endless! 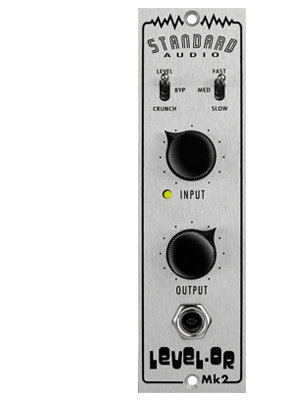 The Standard Audio Level-Or is an API 500-Series rack compatible JFET limiter / distortion processor. The design was inspired by the Shure Level-Loc PA limiter, popular for its trashy, ultra compressed sound. The extended features of the Level-Or allows it to achieve what the Level-Loc does and much, much more. Between these two available modes, there is a huge array of sounds that can be produced from this unit. Simple drum loops can be taken from boring to unique and drum room mics can be crushed or distorted to taste adding size and character to the overall sound. Bass, guitar, and keyboard sounds can be manipulated, taking on completely new and different sounds than the original source material. *Note: Due to the nature of the design of this unit, it is very aggressive sounding; with noticeable pumping, distortion, and some noise. We consider this a good thing! 1603 E. 9 Mile Rd. © 2009 - 2018 M1 Distribution. All rights reserved.